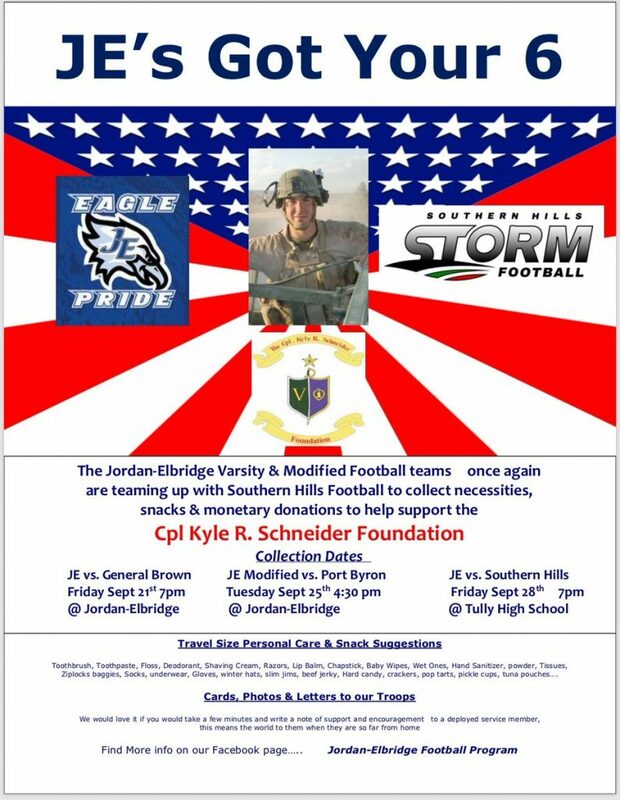 Jordan Elbridge Football Teams are teaming up with Southern Hills football team. It is important to them to support their fellow football players and communities in recognizing and helping out our armed forces who defend our freedom. We will also recognize all first responders and military personnel before the game. The Corporal Kyle R. Schneider Foundation is a non-profit foundation, formed in honor of a fallen United States Marine. He dedicated his life to serving his Nation and his Community. The Foundation was formed to carry on Corporal Schneider’s legacy of leadership and service, with a focus on families of fallen members of the armed forces and returned heroes. There will be three games in which the football teams are rallying support from their communities to collect Personal Care items and snacks. They are also asking the community to write a card or letter of encouragement to a deployed service member.